Allow me to explain why a greenhorn like me, instead of someone who has fished for 40 years, is writing this report of a PFF Pack Trip to Lillian Lake in the Ansel Adams Wilderness Area. Well, I don't mind telling you the reason. It's quite simple. The venerable assistant fishmaster for the Pack Trip, Mr. Pinelli (I used to call him Mikey, but I decided to be a bit more formal), asked me to do it. That's right. That's all it took. All he had to do was ask me. You see, Mr. Pinelli has several cousins who wear black suits, carnations in the lapel of their suit coats, and carry metal in a holster under one of their armpits. When Mr. Pinelli said it would be nice if I wrote the report, I never hesitated to agree with him. As a matter of fact I considered it prudent to consent without any reluctance or hesitation, whatsoever. I had the distinct impression that I might receive a visit from Mr. Pinelli's relatives if I refused, and I really had no desire to meet any of his cousins. I value my kneecaps too much to even remotely insinuate that I might not be qualified for this task. Mikey (sorry, Mr. Pinelli) smiled when I consented. I got the message and began planning, in my mind, for the task of writing the report. If you don't know what I'm talking about, you obviously have led a very sheltered life and have never lived in Chicago or back East. Would you like to know who made the trip? Well, Oscar Guzman was the fishmaster, Mikey (Mr.) Pinelli was the assistant fishmaster, David Black, David Harris, Tom Kilfoil, George Conway, Wayne Taylor, and I, made the journey. It was more than a journey, it was a happening. Wayne Taylor (know as the silent one) insulted me during the entire 4 hours of the trip. It's a wonder that a quiet person like me was able to survive the tirade he spewed forth. 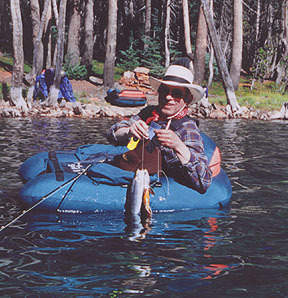 A few days of experience showed me that a Packhorse Fly Fishing trip requires a considerable amount of travel by car and horse, a modest expense, a good deal of stamina, pain, and an expenditure of energy far in excess of the energy required to haul in a 2 or 3 pound trout. It is axiomatic to say that a trip like this requires only a marginal amount of sanity (this is another way of saying you have to be slightly nuts to pay someone to punish your gluteus maximus (your behind) by strapping it into a saddle). It also demands a fanatical passion for fly casting. Let's face it! The horse hates you. All the horses hate you. They insisted upon defecating, urinating, and releasing gas in huge amounts right in front of you. Some of the guys wore bandanas. They said this was to filter out the dust. Don't you believe it. They couldn't stand the gas. Back to the horses. These animals have no modesty. Believe me. They are crude monsters. Add to this the fact that the sadistic saddle could hardly wait to slap the living daylights out of our bottom, and the inside of our thighs will never forgive us for the punishment rendered to them during the 4 plus hours up and 4 hours down the mountain. I am reminded that the word "fan" has its origin from the word "fanatical." After this trip I knew the true meaning of the word fanatical. Do I have to say any more? The camp was located at an elevation of 8850 feet above sea level, about 12 miles from the pack station where the horses and mules (used to reach camp) are stabled. The ascent of the mountain required that 8 of us guys make a 4 1/2 hour horseback ride over a challenging, rocky trail. Horseback ride is a non descriptive term for torture in the saddle. Believe me, torture is not an overstatement if one wears boxer shorts and a pair of Levis. I am certain that boxer shorts are made by Indians because the darn things creep up on you and cause bodily harm. My boxer shorts came off at the half way point break in our ascent. Forget it girls! I am not going into any more details than this. I know the guys can empathize with me. OK. Now comes the good part. We arrived at our final destination: a magnificent forest of redwood trees, an indescribably beautiful blue lake surrounded by majestic, white granite cliffs, crisp fresh air, and a silence permeated only by the cawing of crows. Sadly, there are no eagles or osprey at this altitude. Oh yes, there were some sounds emanating from the 8 lost souls: groans, and other natural sounds which I shall not describe other than to say they may have been the result of indigestion produced by the relentless shaking of the saddle and its occupant. Alas. After reaching our destination and after the arduous, punishing ride (punishing to many, but not all of us) the work of setting up a camp (constructed from the various items removed from the backs of 11 mules) began in earnest. However, nothing happened until 8 men dismounted their trusty steeds (with considerable caution and pain) to stand on terra firma. Dismounting was a slow, deliberate, and a sight to behold. There was no John Wayne in the group. No one hopped off with alacrity. No one! Yes, a saddle can cause one to lose the feeling in all the muscles from the waist down? Standing upright should not require a challenge to ones athletic ability, but it does after 4 hours in the saddle. Believe me! It does. None of the machos wanted to admit there was pain. They didn't have to. They all walked with slow, ginger steps and breathed deeply to capture as much oxygen as possible. Needless to say, we were all in great Olympian condition. If you believe that I would like to talk to you. I can sell you a bridge real cheap. "What the heck is this thing for?" "I haven't used this tent in a long time." "Do you know how this damned thing is supposed to work?" "Where are you going to set up your tent?" Questions. Questions. Some answers. Still looks of consternation. However, after an hour the mess tent and all the tents were set up. At this point you looked around and all you saw were expressions of relief and exhaustion. Let's face it, working at 8850 feet requires a lot more effort than one realizes. The red cell content in the blood is still too low to sustain constant activity. Not enough hemoglobin for a few days. No escaping the reality of altitude and age...just determination, optimism, and the relentless quest for the launching of a fly over the crystal blue water in search of the hapless creature known as trout. The beautiful, wondrous, courageous little battler soon to become prey to an artificial insect created by an ardent student of the art and science of fly fishing and fly tying. Fly fishing is the civilized way of prowling the waters of the deep in search of an elusive trout traveling in search of food in a caldron of blue surrounded by magnificent green pine trees, mountains reaching upward toward the azure blue sky...or a star studded sky punctuated by a glorious, yellow moon. Yes, I am waxing poetic. It's impossible to write about such natural grandeur without being poetic. If man has a soul, then it is in these environs of natural beauty where the heart and soul speak to one another to allow man to enjoy life at its best. The trout knows where all this majesty resides. Find the trout and one finds nature displaying all of its wonders. 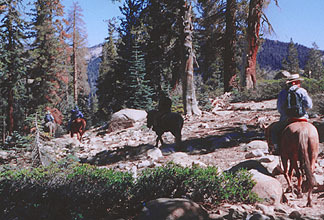 I forgot to mention that the horses and mules left camp for their return trip immediately after the gear was unloaded. We were alone, and I do mean alone. This is the wilderness. Yes, wilderness. Humans come here, but not often. We saw a few humans, but not many. Now the mundane. Time to cook, drink, smoke a pipe, tells stories, and brag a lot. The menus included chicken cacciatore, Spanish rice, pasta, and broiled chicken breasts. Each evening is pure joy. Recalling the experiences of the fishing day makes wonderful palaver. The greenhorn learns, and the expert revels in his mastery of the art. Incredible as it may seem, we feasted each night. Preparation for the repast was not left to chance. The fishmaster made it clear that each of us had the responsibility of providing sustenance for the gang. I was amazed at the quality of food provided. It was too good, too much, and too fattening. But, we loved it. Nights were cold and noisy. Snoring came from three directions. None of the culprits would admit guilt. Temperatures sunk into the 40s, and my blasted sleeping bag did not keep me warm. I shivered every night and did not sleep well. However, the exhilaration of anticipating the next days excursion and casting on the lake kept my heart and soul warm...not my body. Should I describe the fear of venturing out into the cold and dark to reduce the hydrostatic head created in the bladder of a 72 year old man? No. I won't do it. You're safe. I just heard a sigh of relief. Fishing was good. Not great, but good. We all caught fish: rainbows and browns. Most of them were in the 16 inch range. Some were a bit larger, and some smaller. We used dry flies and nymphs. The intermediate sink line seemed to do the best job for several of us. Tom Kilfoil tied flies. Wooly buggers were hot. Tom gave me one of his flies and I caught several fish with it. Thanks, again, Tom. I told you fly fishing was an insane passion. Well, David Harris was on the lake until after 10 PM. Is that passion, or is that passion? He caught over 20 fish that night, and all in the dark. We had Walkie Talkies to communicate with him and were able to share some of his excitement. What an experience. Imagine the beauty of fishing under the stars and an almost full moon. The view of the lake and mountains illumined by the moonlight was awe inspiring. One was mesmerized by the sight. Honest. We just sat there as if in a trance, marveling at our good fortune to be in such a place at such a time. I have never seen anything like it. Many were jealous of Dave Harris: this true, inspirational sportsman. However, none joined him. 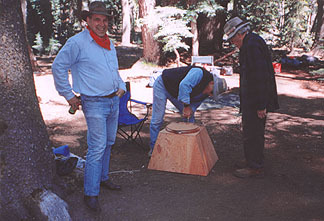 Dave Harris, Dave Black, Oscar Guzman, and George Conway made overland trips to Shirley Lake. This was not a trip for weaklings. I was impressed. The guys not only made the trip, they caught lots of 6 to 8 inch fish. After several days the challenge of the return journey beckoned. The wranglers, horses, and mules appeared from behind the trees, announcing their arrival with snorts and hoof beats (the horses and mules, not the wranglers). Maybe it was Wayne Taylor and not the horses and mules? We started the descent. However, we were now a lot more tired than when we arrived. So, the wear and tear on the old bod was a little more severe on the way down than on the way up. After 4 hours the moment of joy had almost arrived. We are about 30 minutes from the stables when a fawn jumped out of nowhere, frightened the horses, one of the horses stumbles, and Tom Kilfoil was thrown to the ground. The gods were with us: no serious injury but a lot of stiffness. We were all shocked, momentarily silent, apprehensive, and very thankful that there was no serious injury. A search for the lens of one of Tom's spectacles was made, its found, and we continued on our way. Immediately upon reaching the stables, we repacked our gear into 3 trucks and after a 5 hour car ride we arrived home at about 11 PM with a single thought in our minds: take a shower. Why this? Well, baby wipes were our source of cleanliness for several days. With all the water near by, why didn't we take a bath? First of all the water was 59 degrees. Wayne Taylor told us it was 59 and he was right: one of the few times. No thanks. 59 degrees is OK for trout, but I take a pass on it for a bath. I'll use the baby wipes. The most serious deterrent to using the lake water for bathing is, as you know, that it contains harmful bacteria and is not potable. Yes. We all had water purifiers to supply fresh drinking water, but pumping enough aqua for a shower would require a couple of hours. Baby wipes are fine and good for the complexion. Ask any baby. The end result was that we were all happy, healthy, satisfied, and we each shared in a wonderful experience. We relished every moment we spent in one of the most beautiful areas in the World, and in our dearly beloved United States. Most important of all, we became closer friends. The PFF produced another prize winning fishout. Thanks Oscar and Mikey. You did a great job. I also want to thank all my fishing buddies (especially Wayne Taylor) who helped me so much to learn how to become a better fly fisherperson (note the gender, ladies).